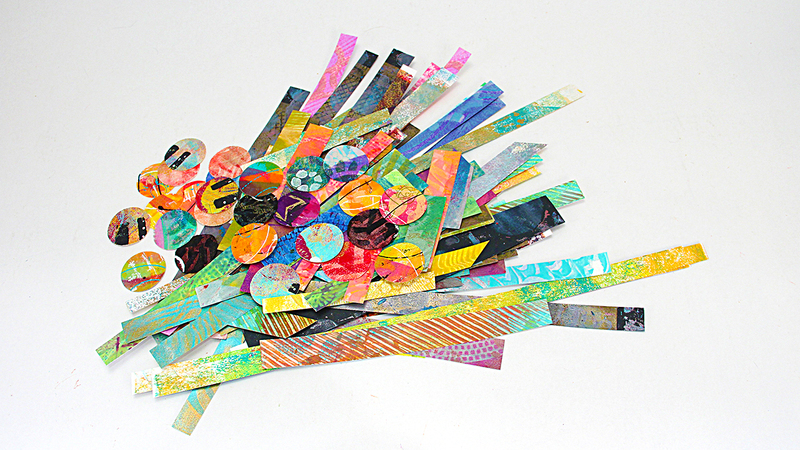 It’s easy to accumulate more scraps than you know what to do with. They’re too pretty to throw out, but not large enough for another project. Along with some fabric scraps, let’s give them new life and see what we can create. In this class you’ll learn how to combine a pile of card stock scraps and painted fabric to create a beautiful art journal page. Are you an Art Journaler? If you are, I bet you have more than one journal. Having only one journal is like trying to eat just one potato chip. Impossible! I’ve never been able to fill ALL the pages of one journal before succumbing to the temptation of beginning another. For many people, the hardest part about creating an Art Journal page is getting started. Blank pages can prove to be very challenging for people who are just dipping their toes into the Art Journaling waters. It can sometimes prove challenging for an experienced Art Journaler, too. Well, you could brush or scrape paint on several pages. When dry, the color can inspire an idea and get you started. Or, you might get out a few stencils and spray inks. Randomly lay down a stencil and lightly spray the page. Let it dry. Add another stencil and spray with a similar color of ink. (Think colors of the sun easily go together and color of the sea blend beautifully with each other. It’s good to avoid mixing "sun" and "sea" when you’re learning to work with color.) When the pages are dry, you’re ready to begin. If you like texture, glue some thin papers like tissue paper, decorative napkins or thin scrapbook paper on your pages. These papers are difficult to glue down smoothly, so they provide great subtle texture for a background. The colors of the papers will be a great starting place for the pages, too. It’s great to have journals for different purposes. One of my favorites is my positive words journal. I’ve always loved words and collected quotes, so this journal allows me to explore color and background techniques before adding words to the pages. Adding new, created pages or partial pages to an existing journal is fun to do, too. In this class, I’ll be showing you how to construct a page from scraps of paper and fabric that will be tipped in (or added) to an art journal. I know you will love the process and I’ll show you just how to do it. Download your class notes and I’ll see you in the class.